This is a drawing from my sketchbook. I was at my sister-in-law's house up in the hills of Humbolt Co., and had some time to spare. 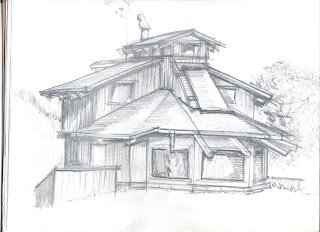 So, I decided to sketch her house. It is a different looking house, obviously vintage 70's hippy-style. It is very cool, though, with a lot of beautiful redwood. Anyway, I think I caught the essence of the design well, and it reads very clearly also. It is fun to look through old sketchbooks and come across little gems like this.